Brooklyn nightlife producers Coral Foxworth and Raechel Rosen are fighting the patriarchy — one party at a time. Photographer Leah Bank captured the revelry of the first ever Femmequerade Ball — bask in the boogie below! — while the duo gave us the lowdown of the second femme-tastic soiree, The Witch Ball, coming to the hot heart of Brooklyn on October 25. The parody of the boot-stomping, man-hating feminism remains a poignant and cheeky way to reclaim space that is often a site for violence against and harassment of femmes. 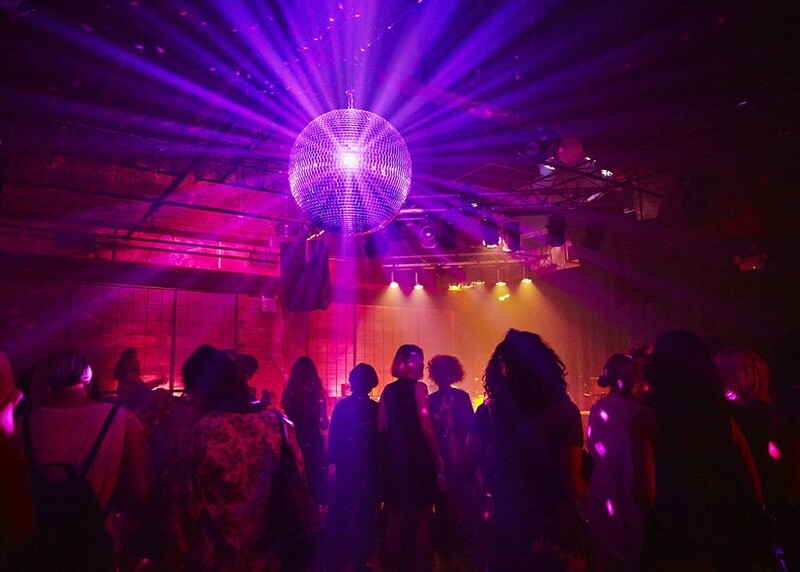 Rosen wants to show partiers how “fun being militant can be,” and provide a place where costumed guests can boogie under the heady lights of a disco ball and twirl in plumes of smoke while MC Marcia Belsky cracks jokes about the patriarchy. The first Femmequerade’s roster this past August boasted a diverse array of pop punk, rock, electronic . . . and beyond. Rosen curated live musicians including T-Rextasy, Ashni, Meager Pencil, DJ Dylan Sparkle, Jay Boogie, Nani Castle, YATTA, and Moonbear. Foxworth — also known as FXWRK — will flank a robust DJ set (including herself, WWIII (Soleil Grant) and Abyss X) with Grammy-winning singer Anna Wise alongside Latasha Alcinor. YATTA, Coven of Mima Good, and DJ Dylan Sparkle will also re-join the fray. An administrator of Sister — an international collective of women and non-binary people in electronic music — Foxworth is part of a rich web of artists. The collective takes the form of a private Facebook group with over a thousand members globally, hosts an event series in several cities, and also manifests as a Soundcloud mix series. After years of DJing in NYC, Foxworth notes a distinctly “territorial, almost masculine vibe” to NYC nightlife. Certain nightlife contexts feel unsafe, and not just due to the all-too-common threat of sexual harassment and violence. “It’s in the vibe of a place. A closed-ness,” she says. Mima Good keytar-ing in pigtails. The upcoming event in Brooklyn will also feature a pop-up shop and tarot salon by Catland — a metaphysical boutique and event space for Occultists, Yogis, Pagans, Mystics, Witches, and beyond (of course!) — in East Williamsburg. Keep yer eye on the Facebook event page for updates, details, and things that go bump in the night. If you like dancing, reveling, and celebrating femmenergy while gyrate-smashing toxic masculinity, you’re gonna wanna get thee to the Good Room in Greenpoint, Brooklyn on October 25. Everyone — and their mother, as they say — is welcome, but sorry, straight cis white men, you’ll have to pay an extra $3 at the door for admission.